Pareto Principal in Social Media Marketing ! 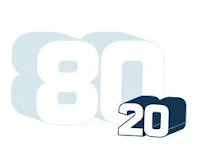 The Pareto principle (also known as the 80–20 rule, the law of the vital few, and the principle of factor sparsity) states that, for many events, roughly 80% of the effects come from 20% of the causes. It is a common rule of thumb in business; e.g., "80% of your sales come from 20% of your clients”. From my personal experience I can suggest that the 80-20 thumb rule applies for social media marketing as well. We can certainly state that very small portion of effort is attributed to the leads .But irony is we don’t know which part of effort works ,hence we don’t have much choice left ,except keep trying to maximize the probability of the desired output to get realized. 80% of the time, you should be sharing non-promotional content. The other 20% of time, promote your brand. 80 % of your Social Media Marketing time, should be spent in listening. The other 20% of time, open your mouth. Rising Significance of B2B portals in Downturns! B2B Marketing has always been about networking. In recent years means of networking has changed significantly. During slow downs firms must test new strategies and tactics to improve marketing effectiveness and reduce the cost. Businesses need to maintain agility and adapt to an evolving marketplace, but cannot sacrifice tried-and-true tactics that have driven their lead generation programs for years. Recent studies by firms like Marketing Sherpa indicate that marketers are investing in tried-and-true tactics such as trade shows, website marketing and email, and are allocating the greatest slices of their budgets to these tactics. Trade shows have claimed the greatest percentage of marketing budget allocation in year 2011, with its greatest supporters being large organizations. On average, organizations of this size invest a third of the marketing budget to trade shows. As the use of tablets, e-readers and smart phones increase, and more print publications add online services to readership, organizations in the media or publishing sector are prioritizing websites with the greatest average budget allocation of 22%. The B2B Portals like Alibaba.com, NetworkToday.com, and IndiaMART etc are increasingly becoming the starting point of information search in case of B2B marketers. There are many other B2B Communities portals which are operated by community as non profit organization but they most lack the cohesiveness provided by B2B portals operated by companies.